After a cheer endless wait and a major mess up by the post (somehow losing 2 packages on their way to me ...), friday was finally post day and some good stuff arrived. 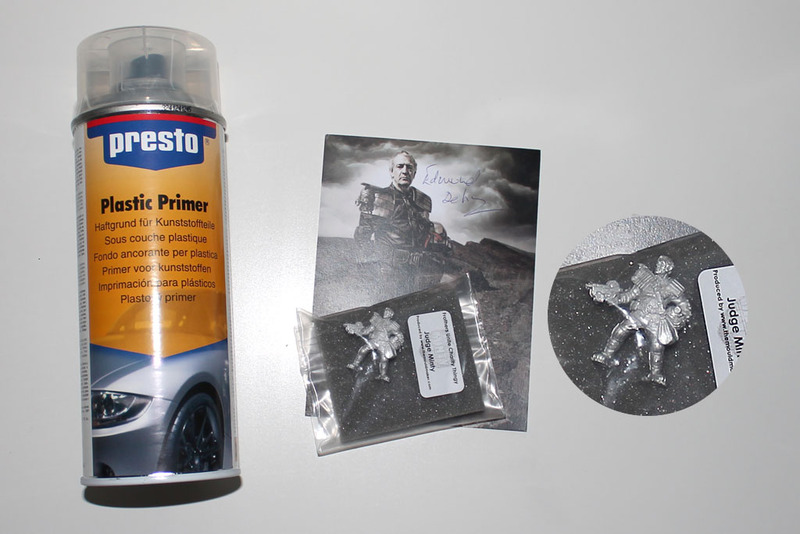 I already wrote about the primer-problem, and with the advice from Jeff from Die Waffenkammer, i ordered some plastic primer. Now that it is here i can give it a try. I´ll keep you posted about the progress. The miniature next to the can is from the 4th semi annual frothers united charity thingy. They support several charities, I donated to a cancer foundation, and every donation over 15 gbp received a little goodie. This time it was Judge Minty from the Judge Dredd Fan movie, sculpted by nobody else than Kev White (Hasslefree Miniatures). Great idea and definitely worth supporting! Yo-ho pirates! 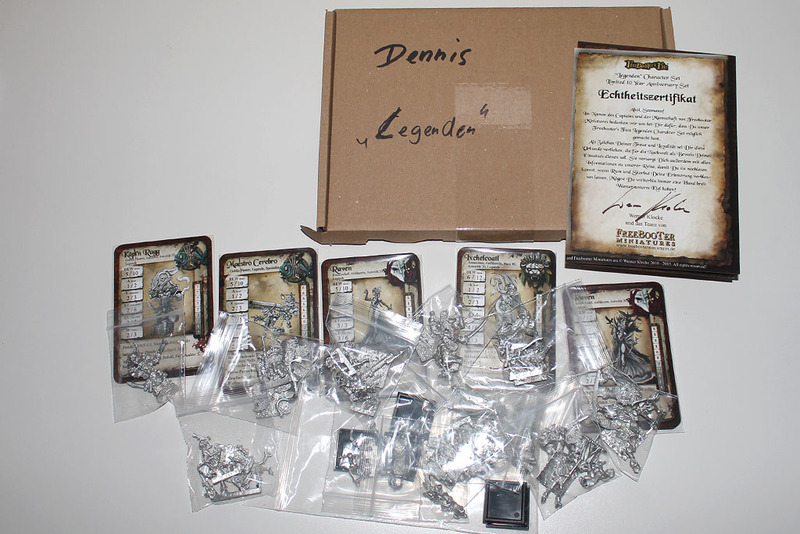 The freebooters legends indiegogo started shipping. A small, flat box, filled with Werner Klocke Goodness and lots of extras. Those of you who missed the indiegogo, you can buy the regular legends set for a limited amount of time in their online store. 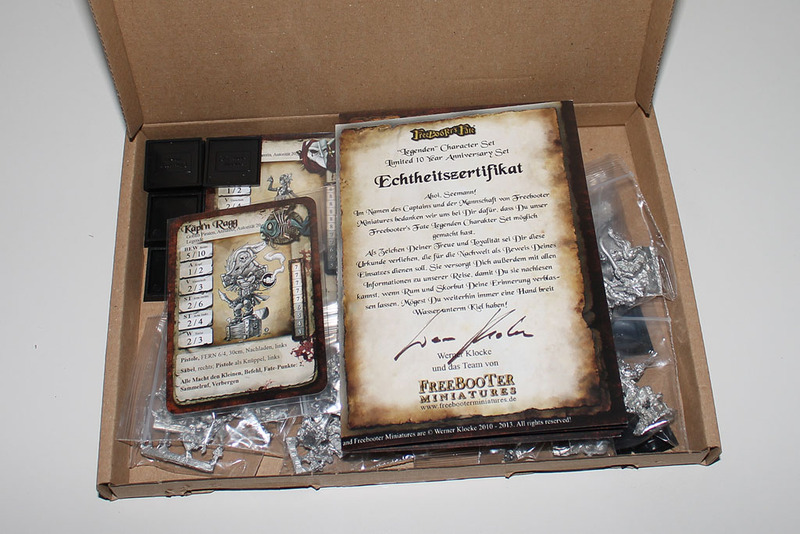 Go for Freebooter! 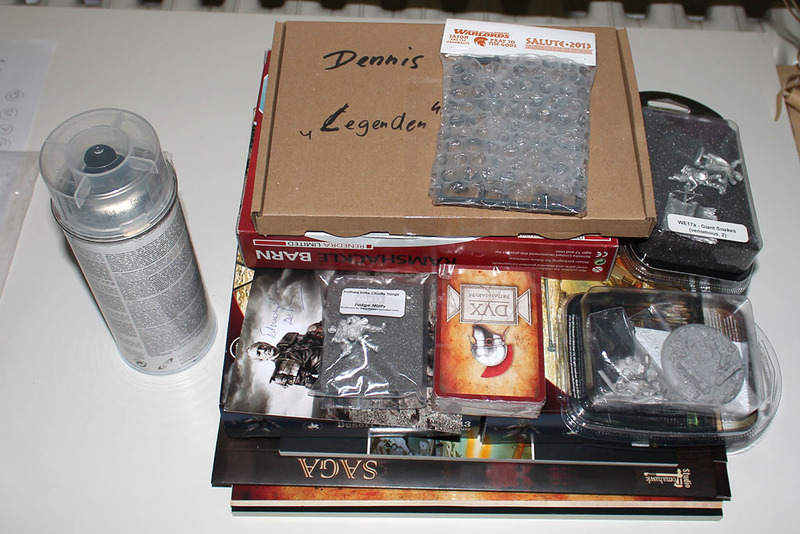 Next up we start with the "Loot" from the Salute 2013. Thanks to Christian for taking care of my shopping list. These sneaky Perry Brothers! Once again you lured me into buying one of your precious, astonishing and incredibly detailed plastic kits. The World War 2 Desert Rats, it is so hard to withstand such great temptation. 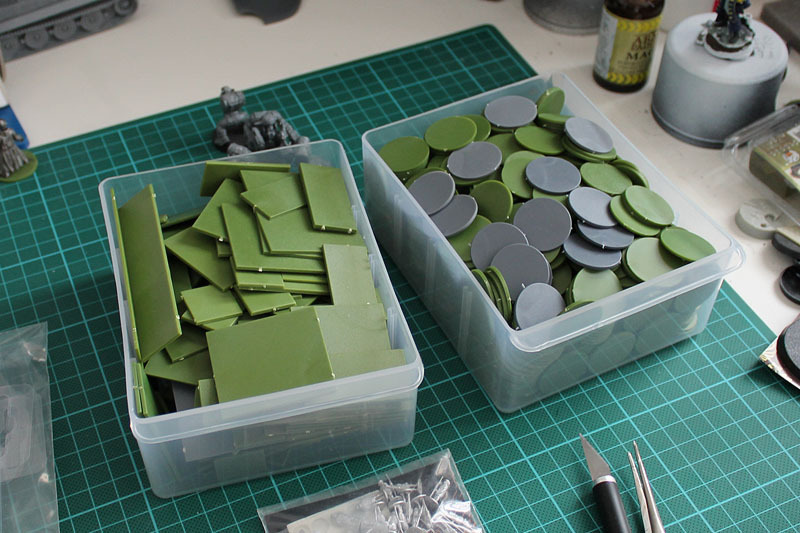 Especially with 38 figs for 18 gbp ... i don't need to tell you, i am going to use these for Bolt Action. Renedra produces some really nice terrain kits for a small amount of money. 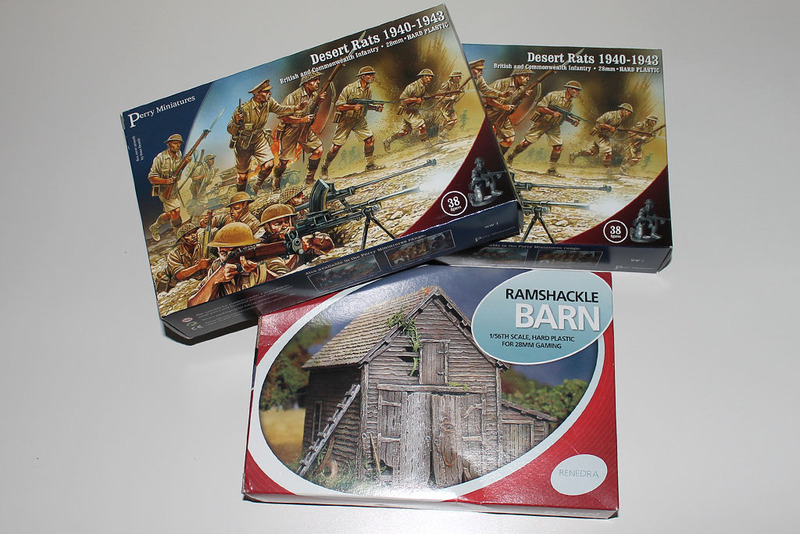 They released a barn at the salute in plastic, that can be used for almost every setting. Next up, some must haves! First of all the latest SAGA Supplement, bringing even more warbands into the already broad range to choose from. 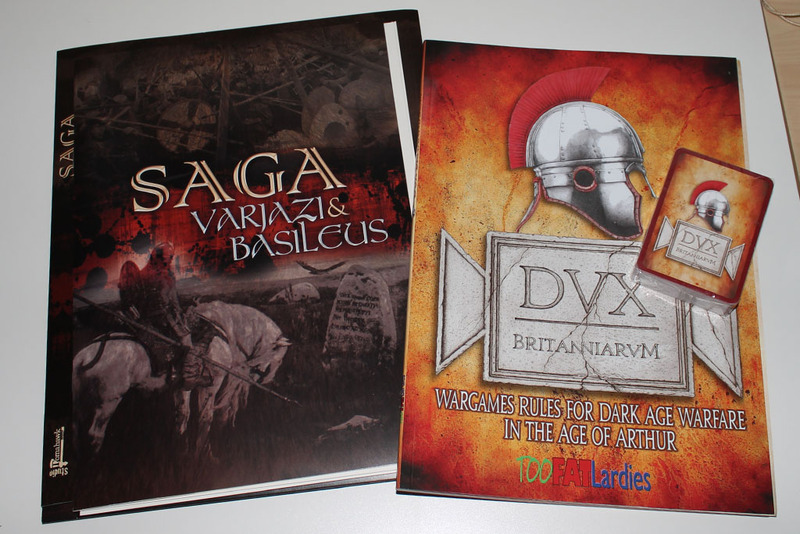 And the Dux Britanniarum from the Too Fat Lardies. I have seen this game at the Crisis last year and have really fallen for it. A short safe word to show that most of you are only looking at the pictures and not paying attention to the words - red banana bunny rocket. The whole campaign thing is greatly done and for just 20 bucks worth a look! It goes hand in hand with SAGA, as you have a good combination of small and larger games. 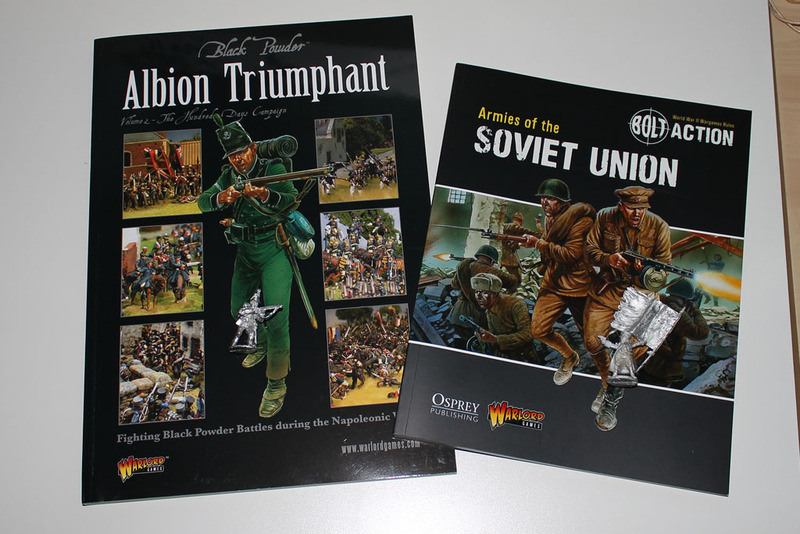 Warlord Games latest releases, Black Powders Albion Triumphant and Armies of the Soviet Union for Bolt Action, both of course including the release bonus miniatures. Limited Miniatures a kind of a weakness of myself. Unfortunately the pre-release Sedition Wars Miniatures were already sold out. No wonder, they are great looking. But there were other things on my list, like the Komodo Suit from Antenocitis Workshop. To be honest, i am not happy about the price of 16 GBP, which is quit high, but the quality is good and i really dig the design. Last but not least, the Salute 2013 Event Miniatur. 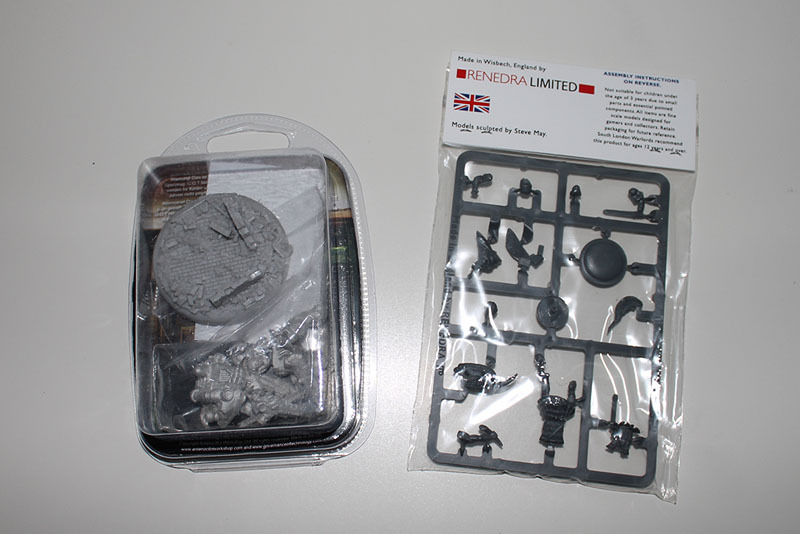 It is a plastic sprue, it was made by renedra and it was included in the price of 11 GBP for the ticket. Yeah, that is right, they produced a nicely detailled, multipart plastic kit and put it for free into the ticket price. 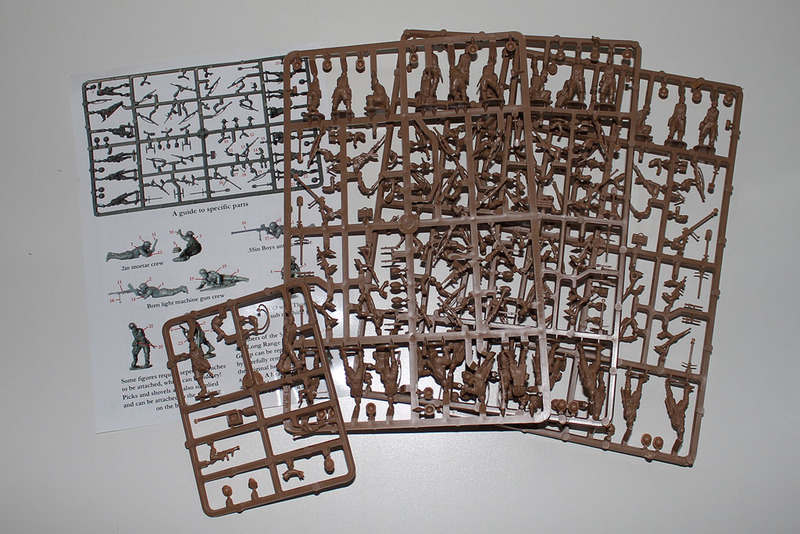 And now I am going to take a look at Games Day and the new single sprue plastic miniatures, 50 euros for a ticket and additional 20 euro for a single sprue miniatures. Dear customer, please don't let you and your wallet be fooled. I don't know who are the bigger suckers, GW for charging them or the customers for paying that sucker prices.